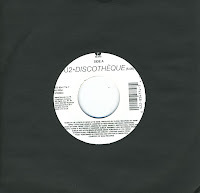 The single 'Discotheque' was the start of one of a controversial period for the band U2. Critics and fans were put off by the dance-inspired album 'Pop' and the band themselves later expressed dismay at the fact that they had to finish the album too quickly because the accompanying Popmart tour was already booked. The single was released in February 1997 after the track had been leaked on the internet. 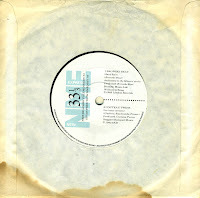 There was a fear that this leak would harm sales, but of course it didn't: the single reached number 1 in the UK singles chart as well as in Ireland and New Zealand. In the Netherlands, 'Discotheque' reached number 9. 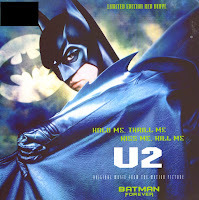 'Hold me, thrill me, kiss me, kill me' was originally recorded during the sessions for U2's 1993 album 'Zooropa'. It didn't make it onto the album, but in 1995, it was contributed by the band to the soundtrack of the movie 'Batman forever'. The track was also released as a single. In the UK, a 7" single was released as a limited edition, pressed on red vinyl. The single reached number 2 in the UK singles chart and number 9 in the Dutch Top 40. In the US Billboard Hot 100 chart, it got to number 16. 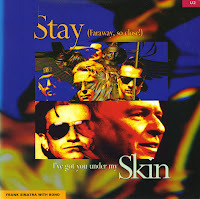 Bono and The Edge worked for a long time on 'Stay (Faraway, so close! )', a track that was inspired by the music of Frank Sinatra. They actually made the melody during sessions for U2's album 'Achtung baby', but only completed the song when they heard that Wim Wenders was looking for a song for his new movie 'Faraway, so close!'. he single's B-side featured the song 'I've got you under my skin', as a duet between Bono and Sinatra, which was originally released on Sinatra's album 'Duets'. (I wonder how many U2 fans were excited about this track...) Released in November 1993, the single reached number number 4 in the UK singles chart and number 10 in the Dutch Top 40. 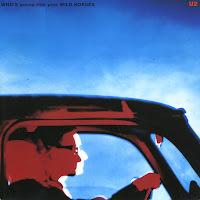 U2 recorded 'Who's gonna ride your wild horses' many times during the sessions for their 1991 album 'Achtung baby', but they eventually ended up with a version that was very similar to the original demo. Bono wrote the song's lyrics for The Edge, who was going through a rough divorce from his wife during the recording sessions. 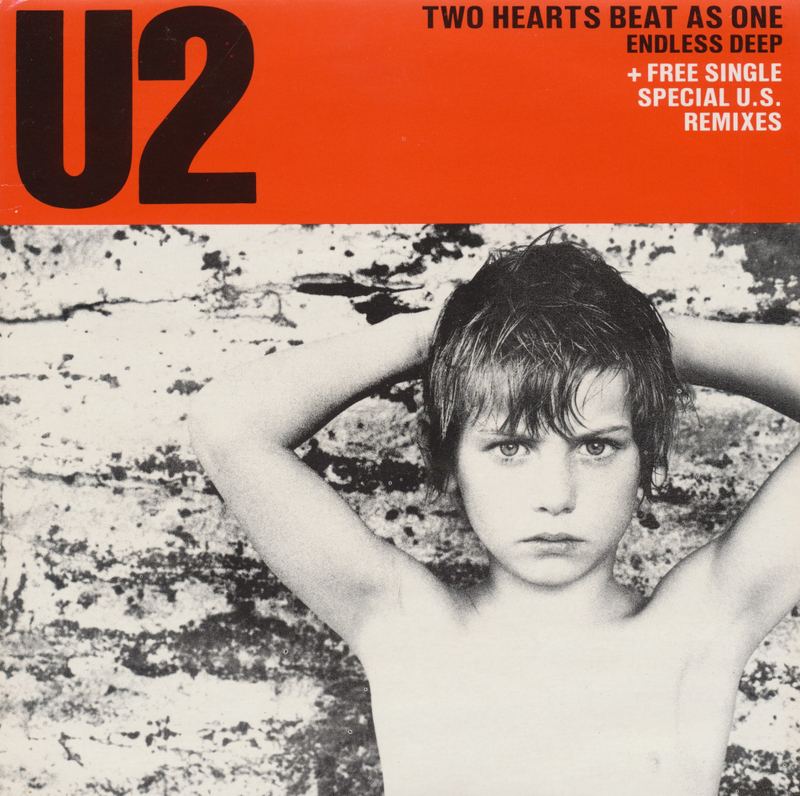 Bono has commented that the band were still dissatisfied with the track: 'It's a song I feel we didn't quite nail on the record because there was another whole set of lyrics that were dumped and I wrote those quickly and off we went.' The track was remixed for the single release. It reached number 14 in the UK singles chart and number 13 in the Dutch Top 40. 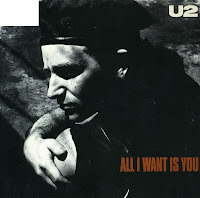 'All I want is you' is a track on U2's 1988 album 'Rattle and hum'. Although I really didn't like that album, this was the one standout track from that album and I was glad to see the single release - although the 7" single contains a rather ugly edit of the track. 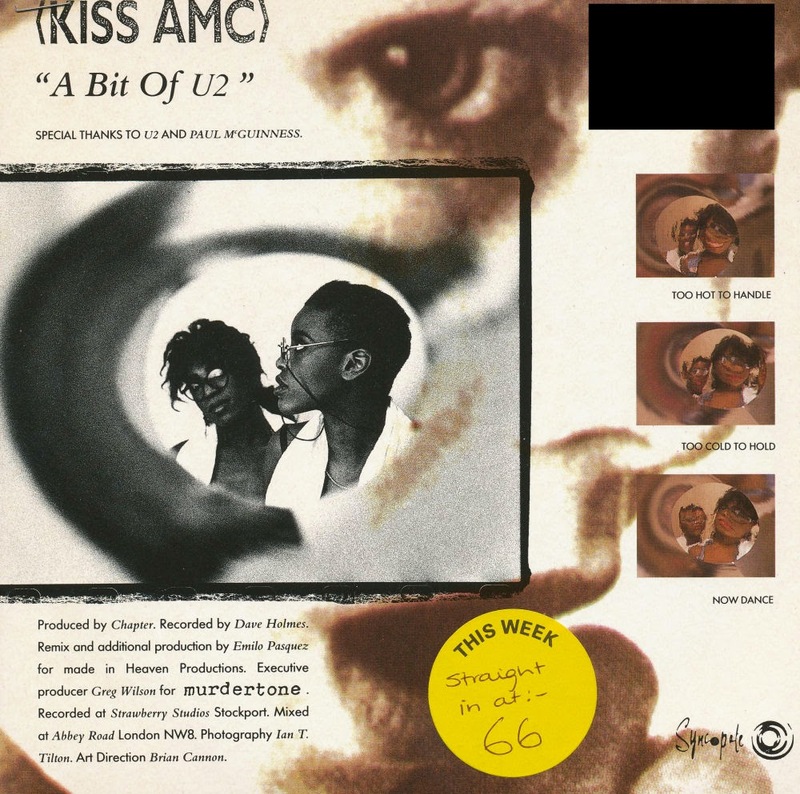 The single reached number 83 in the US Billboard Hot 100 chart, number 4 in the UK singles chart and number 12 in the Dutch Top 40 upon its original release in June 1989. I think this single is definite proof that I'm a sucker for special editions. The song 'Desire' was never really my cup of tea, but the gatefold sleeve was so nice, that in the end I still bought this single. I was very disappointed with U2 at this time, since they'd made such great singles before, and they were going down a very 'American-sounding' road with the album 'Rattle & Hum'. And everyone knows that British music always sounds better. The single reached number 1 in the UK singles chart, number 2 in the Dutch Top 40 and number 3 in the US Billboard Hot 100 chart. 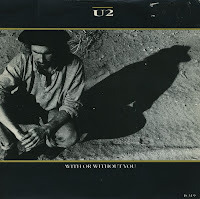 'With or without you' is the song that took U2 to superstardom for good. They scored their first American number 1 hit, launching the album 'The Joshua tree' with a bang. At the same time, band leader Bono became involved in way too many charities, taking on some kind of Jesus image - something he would never shake off since then. The single also reached number 4 in the UK singles chart and number 2 in the Dutch Top 40. The song recently re-entered the UK singles chart in May 2009 at number 43, based on download sales alone. This month sees the release of the deluxe edition of U2's classic 1984 album 'The unforgettable fire'. It is a milestone in the history of music, and best of all: the deluxe edition will contain a bonus disc with two previously unreleased tracks from the album sessions, plus the B-sides and remixes that have been so hard to find until now. 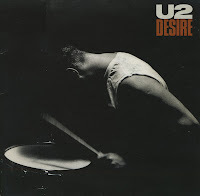 This is the double single edition of the title track, released in 1985. I was truly in love with this track at the time, and would have killed to get the double single my sister came home with in May of that year. Fortunately, these double singles weren't so hard to find in the Netherlands (unlike many other double singles at the time). Five tracks of pure genius. U2 were never again as good as they were back then. 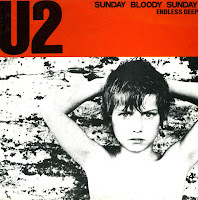 'Sunday bloody Sunday' is a track from U2's 1983 album 'War'. 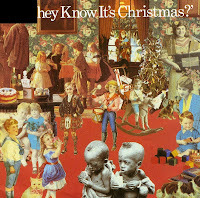 It was originally released as the album's third single in March 1983. However, this copy comes from 1985, when it was re-released after the success of 'The unforgettable fire' in the Netherlands. It is one of U2's most overtly political songs, its lyrics describe the horror felt by an observer of The Troubles in Northern Ireland, mainly focusing on the Bloody Sunday incident in Derry where British troops shot and killed civil rights marchers. 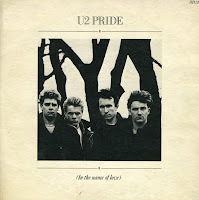 This re-released reached number 3 in the Dutch Top 40 in October 1985. In 1982, a relatively new band called U2 performed live in the Netherlands. The performance was recorded by Veronica, a Dutch broadcaster. 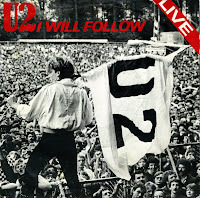 When their recording of 'I will follow' was played a few times on the radio, the demand was so big that it was released as a single. Contrary to what you might think, when I bought this single two decades after its release, I didn't have to pay a fortune for it. I was as surprised as anyone when I spotted this limited edition double single during a record fair for a rather low price. Considering the ever growing fanbase of this Irish band, I would have expected the dealer to make a nice profit. Fortunately he didn't, otherwise I would never have bought this of course. 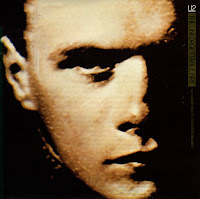 U2 and Brian Eno used the pseudonym Passengers to record an album called 'Original Soundtracks 1', a collection of songs for movies that do not exist. The track 'Miss Sarajevo' protests the war in Bosnia, criticizing the international community for its inability to stop the war or help those affected by it. It was the only single released from the album. Lead vocals are performed by Bono, with a guest appearance by Italian tenor Luciano Pavarotti. The 7" single was released with a large poster, folded to LP size. The B-side is a live performance of the U2 track 'One' during a War Child concert in Modena, Italy on September 12, 1995.